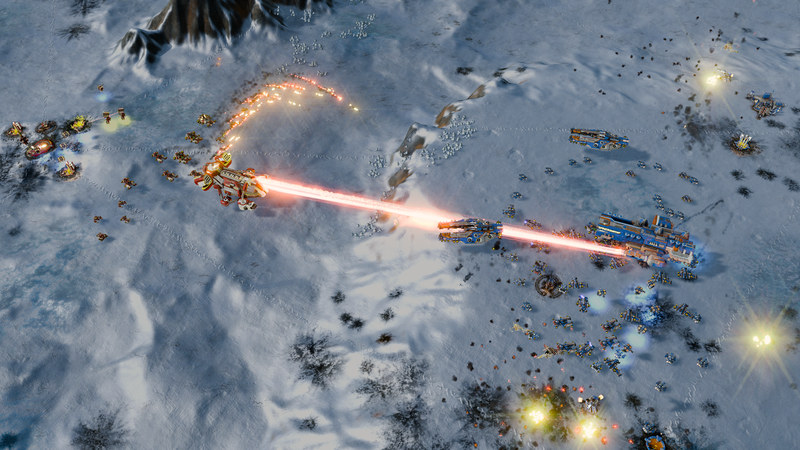 Ashes of the Singularity: Escalation v2.6 Includes Updated Tutorials, Quality of Life Changes, UI Improvements, and More! View the full changelog below. We're retiring our old tutorial and replacing it! Concise and fun, this new set will pack in more important information for new players and provide a better overall learning experience. The unit panel for the UI will be condensed to display information more efficiently and will provide bigger icons for changing panels. Changes to the Observer Mode UI will let spectators easily compare the resource income between players, among other things. In order to offer more opportunities to protect your Nexus, we've added an optional upgrade that will increase the building's health, making it more difficult to destroy. Several changes aimed at improving the user experience and game readability will make the game more accessible to new players. 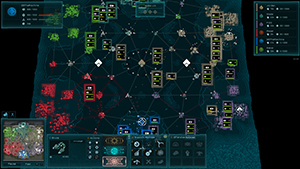 Multiple engineers can now boost the production of units and structures without any diminishing returns. 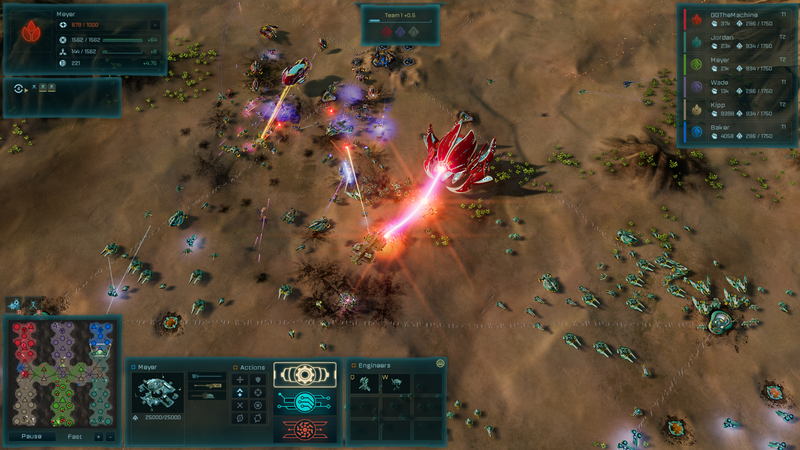 The Sapper and Avatar units can now build advanced defenses without having to manually upgrade basic defenses first. 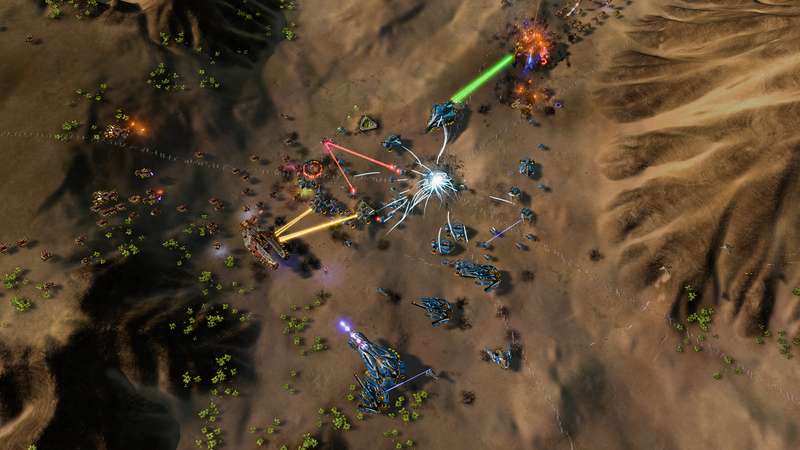 Engineers will now repair at a much faster rate, but are no longer able to repair units - only buildings. Medics will be able to heal units, but can no longer restore health to structures. This gives each unit a much more distinguished role. The production of all Substrate air units is moving from the Assembly building to the Aviary. This makes air strategies more of a deliberate investment that enemy players will need to scout and adjust to accordingly. Get Ashes of the Singularity: Escalation today! Stardock Community Discount and save 10% when you buy direct. We are retiring our old tutorial and replacing it with a new set. These pack in more important information to new players, in a more concise and fun way. We are confident these new tutorials will provide a better experience and first impression to new players. Old tutorial removed and replaced with Basic Tutorial and Advanced Tutorial. Unit panel condensed to remove wasted space and improve the usability and appearance of the Quantum Upgrade and Orbital Ability Panels. 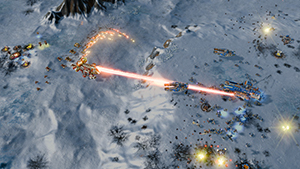 Replay and Observer interface has been changed to show the total income of Metal and Radioactives. It is now possible to rapidly compare economies on the player panel located on the top right corner. Increase Logistics prompt will now play when a player's in-progress production puts them over Logistics limit. For example, if a player has 120 Logistics with a limit of 200 and they start producing a dreadnought, they will receive the Logistics prompt. Prevented duplicate audio from playing simultaneously. Previously, producing multiple units or base defense upgrades simultaneously would cause a sound to play numerous times and potentially become unpleasantly loud. The announcer will no longer play two voice lines simultaneously. Announcer audio lines such as “Dreadnought launch initiated” and “We need more logistics” will now be staggered to play one after the other. Hovering over the Metal and Radioactives icon in the resource panel now displays a tooltip which explains the two resource types. Auto Levelling Dreadnought upgrades option menu now works in multiplayer. “Targets Radar Contacts” removed from weapon tooltips as every weapon in the game now targets radar contacts. Lowered volume of Agamemnon weaponry. Shield bar color changed from green to blue to more easily identify how much shields a friendly unit has. Build progress bar is now the same length as the health bar. 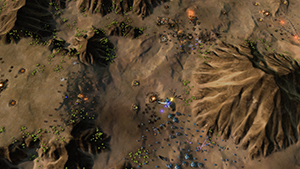 Extractors can now be built on enemy deposits, allowing for easier queuing of commands. Updated tooltips to reflect changes from 2.5 and 2.6. Nano-Mesh Barrier effect has been changed to only display for a brief duration when the ability is cast. We are adjusting the size of frigates compared to other units to make them feel bigger and less like tiny ants to the player. We are also addressing the size disparity between various types of cruisers; all non-heavy cruisers now share a consistent size. The AI will now cast Nanite Assassination on Juggernauts. The AI will no longer cast Nano-Mesh Barrier on allied units. AI will no longer build Instigators. Improved consistency of resource layout on Nightshade. Increased Turinium requirements on Delta Serpentis, Gamma Draconis, Leporis, Merga, Mirach, NightShade, Rigel, Ross 128, Seginus, Talitha. Emergency and Serpentine turrets were intended to be used as an improvised defensive measure, yet they were often used to snipe enemy builders or hold forward cutoffs which was quite frustrating against human and AI opponents alike. We are refining the role of these turrets to only work in friendly territory. Emergency and Serpentine Turrets can now only be cast in connected owned and allied territory. We are making a big change to the way production of units and structures scales into the late game. Previously, diminishing returns limited the viability of using multiple Engineers or Constructors to build a structure or assist a factory. This unintuitive system of diminishing returns is being removed, allowing large numbers of Engineers to reach very rapid build speeds; it's now possible for players to churn out a Juggernaut in seconds, so long as they have a colossal late game economy to support it. Refineries and Harvesters gave almost unlimited potential for economic growth, so we want production speed capable of scaling with that. Removed diminishing returns for having multiple Engineers build a structure or boost a factory. "Base Sniping" was very frustrating in the late game, where players instantly lose the game because their fragile Nexus was destroyed by an air raid and/or orbital attack. Rather than making the Nexus unkillable in the early game, or making the building health upgrade too powerful, we are adding a new a new Quantum Upgrade which allows players to heavily increase the durability of their Nexus. The Nexus is still affected by global building health upgrade. PHC and Substrate now have access to Nexus Health Quantum Upgrade. It was unfair for Substrate to lack any way to viably repair the health of their buildings and dreadnoughts, while PHC using Medics over Engineers to repair structures was unintuitive and could be quite exploitative in large numbers. Engineers and Constructors are being reworked to specialize in repairing structures, while Medics are losing their ability to repair buildings. The Caregiver is not being changed, as Constructors can not "repair" shields, and the Caregiver has a small single target effect in favor of area heals, so they are not effective for healing base defenses in the way the Medic was. Medics will no longer heal buildings. Engineer/Constructor repair rate increased from 15 to 100. Substrate dreadnoughts & juggernauts have less health but more shields. Substrate dreadnoughts regenerate 1 health per second. 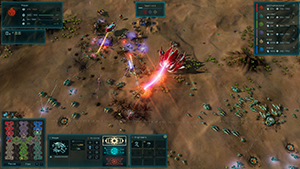 Upgrading base defenses was often used as an exploit to cheat a turrets death, which was quite frustrating and unfair to players. If a basic defense takes damage, it will now be transferred over to the upgrading defense as a percentage. For example, if a Smarty takes 50% damage down to 750 health, and it upgrades to the Barrager, it will only increase health to 1500 which is 50% of the Barrager's total health pool. Players are encouraged to utilize the healing changes to use Engineers & Constructors to replenish base defense integrity. Upgrading a base defense will no longer heal the structure. Completing a structure (or upgrade) will no longer heal the structure. We are reworking the Sapper and Avatar to give them a unique role where they act as means to streamline the production of advanced defenses. Investing in upgraded defenses in the late game could be a chore, due to needing first to build basic defenses and upgrade it once they are completed. This could not be done via queuing up orders, making it an annoying attention sink when income was so high in the game. The Sapper and Avatar can now directly build advanced defenses on the map, with the overall costs remaining the same compared to upgrading from basic defenses. 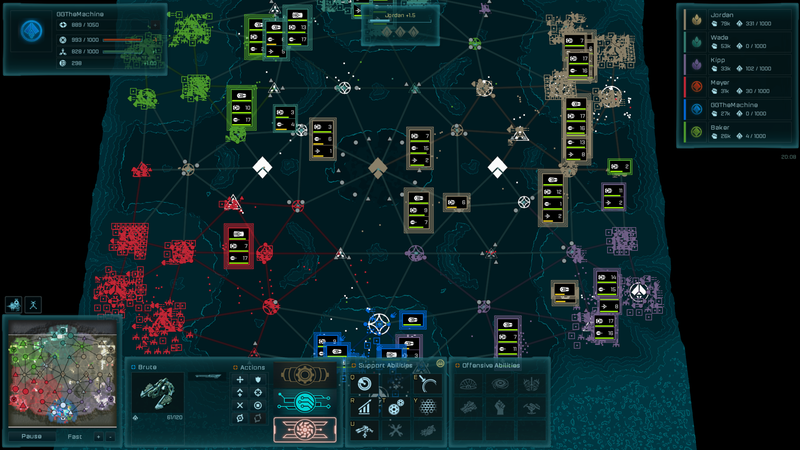 Can now produce economy & production structures, basic defenses and advanced defenses. Advanced defenses have the build time and cost of the basic defenses added. It was impossible to scout a big air transition. Less foresight was required for air transitions due to not needing to invest in air production preemptively. Substrate was able to easily outproduce PHC in air battles. Rushing an Air Rampager came too fast due to only requiring Aviary instead of Sky Factory and Advanced Sky Factory. As a result, we are changing the way Substrate produce air units. The Aviary now produces all air units, in the way the Assembly produces both frigates and cruisers. Light Aircraft moved from Assembly to Aviary. Rampager and Harbinger locked behind tech buildings. Losing Engineers in the late game or on large maps could be quite frustrating as they were only buildable from the Nexus with a long build time. Engineers and Constructors will now be accessible in forward bases, without having to rely on Orbital Abilities which can rapidly ramp up in Quanta price. Orbital Fabricator and Gateway can now produce Engineers or Constructors. The logistics cost of the Hermes did not reflect its value. We also want to make the Hermes more accessible by reducing its long build time. The Martyr was overperforming, and we want to reduce the aggressive potential of early game Martyr spam. Given the Avatar's additional utility in being able to directly build advanced defenses directly, we want to make the Avatar less of a combat unit. Players are encouraged to use the Saboteurs for direct harassment over the Avatar. The Orbital Fabricator unlocks far too much compared to other tech buildings, especially given its new ability to produce Engineers. We are offloading the unlock for the Charon, Repair Bay and Drone Bay onto other tech buildings in order to encourage more strategic diversity in choice of tech buildings. Hyperion was overperforming. It is by far the most durable dreadnought with its regeneration upgrades, so we want to tone down its damage to make it more balanced and to make the offensive upgrade tree more appealing. Substrate Dreadnoughts were generally weaker than their PHC counterparts and were countered too easily by Athena/Mauler. We want to incentivize players to invest in proper anti-dreadnought units with full armor-piercing such as the Nemesis and Eradicator. The Overmind and Nest of the Queen were shut down too easily by splash damage air defenses. We are increasing the durability of their drones to make their performance more consistent. Given the armor and drone buff to the Overmind, it didn't need to have the additional health over other dreadnoughts. Hades were underperforming, and we want to make it more expendable. As per Substrate air rework. It was unfair that production of Harvesters was due to only being available on the Nexus. We are making Harvesters buildable from the Aviary so that Substrate players can more heavily invest in late game economy, as per PHC being able to build multiple Refineries simultaneously. The Instigator was unnecessary on the Nexus due to being such a large investment, making it not viable in the early or mid game compared to the cheaper pan. We are moving it from the Nexus to the Advanced the Sky Factory to suggest when players should invest in this heavy late game scout, while lowering its cost to make it more desirable compared to building multiple Pans. The Aviary is being made more accessible to compensate for the Air Harbinger and Air Rampager being locked behind tech. It was inconsistent for PHC to be able to build Constables without a Factory while Substrate couldn't do the equivalent. This could be frustrating when a player loses their Assemblies and can be completely locked out of anti-air production. We are devaluing the Orbital Fabricator over other tech buildings. Regenerate was not powerful enough to justify being locked behind the highest tier of tech buildings, especially when compared to the PHC intensive care. The late game "Nukes" provided far too much damage potential at only 400 Quanta. Given how much impact they can have, we want to make them more of a deliberate investment with more opportunity cost. Can now claim regions captured by the AI waves. Fixed a bug where vacant start locations in a multiplayer lobby were not selectable. Fixed a bug where the Hyperion could spawn large numbers of repair drones.